I’ve worked some questionable neighborhoods. And by questionable, I mean the kind of place where sullen young men would just as soon shoot you, badge or no badge. So just before midnight on New Years Eve, I’d slip out the side door of the station house, and stand there under the eaves, waiting for it: The distant report of celebratory gunfire. Semi-automatic weapons pointed straight up into the night sky, as if drunken revelers could shoot down the stars. Some years, department-wide memos are issued directing firemen to wear their helmets on New Year’s Eve during all responses—fire or medical. I realize of course that a wooden eave offers scant protection against falling .223 steel-tips, hot loaded in copper-jacketed shells. On it’s return trip to the ground, a round of this caliber can reach a terminal velocity of 300 feet per second—more than enough to penetrate a human skull. And while rare, a New Year’s Eve bullet can kill—it’s not simply some urban legend. In 1994, a tourist celebrating in the French Quarter of New Orleans was struck and killed by a falling slug. And on December 31, 2004, an Orlando, Florida man was hit in the heart by a wayward bullet that seconds before had been shot gleefully into the air like a colorful confetti popper. In fact, between 1985 and 1992, the ER staff at the King/Drew Medical Center in Los Angeles treated some 118 people for random falling-bullet injuries. Thirty-eight of them died. Under the eaves, I think about the year past: Indistinct faces, fleeting glimpses, moments that coalesce and vanish again like indifferent ghosts in search of someone more worthy to haunt. Family and friends may remember these storied lives; I can only recall their unexpected deaths. Others will take some new trajectory—lives deflected by a particular emergency. Frantic family members pacing amber hallways at midnight (a pale body discovered on the bathroom floor), wide-eye car wreck victims wandering aimlessly amid scattered debris, stunned homeowners staring in disbelief as their tidy lives undergo a violent pyrolysis. 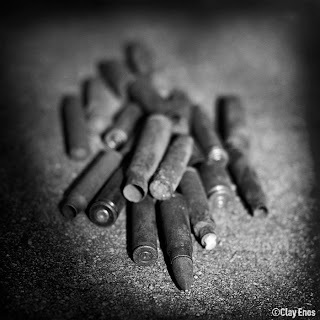 bullets rain down where they will. Are you sure that it was the bullets that killed those 38 people and not King/Drew Medical Center?